Lafayette in the Somewhat United States (Hardcover) | Eagle Harbor Book Co. 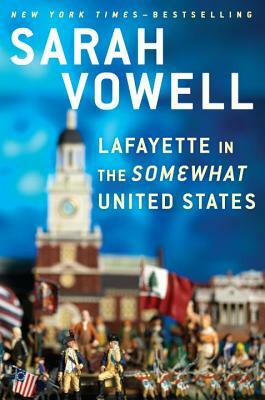 I like Sarah Vowell. She’s the deadpan wiseacre cracking jokes in class who aces the test and carries a biography of Ben Franklin in her backpack. Her love of history shines in this hilarious and insightful look at our nation through the eyes of one of its first celebrities, the Marquis de Lafayette. On his grand 1820s tour of the 24 states, the former general found marching bands and a lot of merchandise with his face on it. He also found a country trying to stay together as its revered founders faded into memory and its cultural divides seemed deeper than ever. Few books explore the ideals that hold Americans together with the warmth and wit of this one.